One of the questions I get a lot when I speak at events like the MoneyShow and TradersExpo is about the benefits of looking at large options trades. Large trades using options, typically called block trades, are often executed by big firms with a lot of capital and resources. As such, block trades can be very valuable indicators of what the smart money is doing with their time and money. Block trades can potentially show you how funds are using covered calls, what stocks have breakout potential, or even what pension funds are using to protect themselves. It’s true, block trades can be professional hedges or they can be speculative bets. Sometimes, it’s not all that obvious what you’re looking at. But, there are often clues. For instance, hedges tend to be long puts or long put spreads (buying a put vertical spread) in index ETFs. That’s not to say that there aren’t large downside bets in index ETFs which are speculative. However, those downside bets tend to be a bit more creative than outright put or put spread purchases. Index puts can be expensive, so speculative options buyers will be looking to keep costs low. On the other hand, hedges are meant strictly for protection, and many firms or funds are willing to pay up for protection (or they have no choice). Of course, if hedgers can find a way to protect themselves cheaply and effectively, they’ll definitely go that route. Take for example a big trade from last week in SPDR Euro Stoxx 50 ETF (NYSE: FEZ) options. FEZ is a fairly popular fund used for gaining exposure to European stocks. The Euro Stoxx 50 index is somewhat similar to the Dow Jones Industrials in the US. It’s comprised of most of the largest companies in the Eurozone, and has the 50 leading companies in their respective sectors, aka Europe’s blue chips. Using FEZ puts could be a very reasonable, and turns out inexpensive, way to protect your portfolio against a selloff in European stocks. 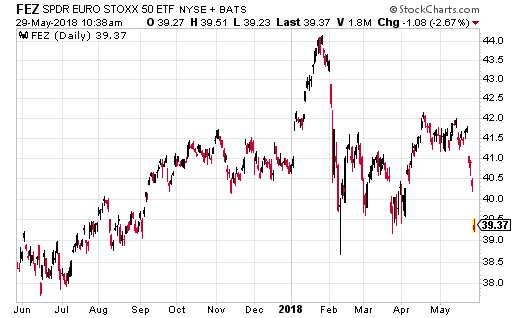 You can see from the chart that the ETF has taken a bit of a downturn of late. Perhaps the trade I’m about to detail is in direct response to the recent move lower. With FEZ around $40.50, a large trader purchased 10,000 July 20th put spreads for $0.31. The 38 puts were purchased while the 35 puts were sold. Breakeven for the trade is at $37.69, and gains are capped below $35 in the share price, or for $2.69 in dollar terms. The good thing about this hedge, which is almost certainly what this is (as a I mentioned above, long put spreads in index ETFs are nearly always hedges), is how cheap the trader is able to get 2 months of downside protection. Moreover, should European stocks pullback, this hedge could generate 868% returns. If you’re looking for a very efficient way to protect your portfolio against European selloff risk, this put spread is a good choice. Two months of protection for $0.31 and 868% percent max returns is hard to pass up as a hedge, or even as speculation.